Francois Gacas and Bernadette Verhoye are living amongst people who are helping others. The couple is already for years active in the association Vleugels van Hoop, which is financing projects in Rwanda and Uganda. 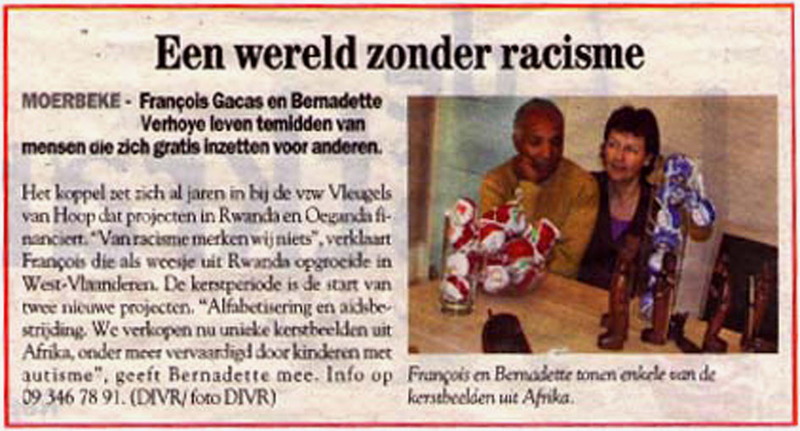 “We don’t see the racism” says Francois Gacas, who was raised as an orphan in West-Vlaanderen. The Christmas period is the time to start 2 new projects. “Alphabetization and aids suppression. We now sell unique Xmas figurines from Africa, also made by autistic children”, states Bernadette. Info on 09/3467891.